The TOGAF documentation frequently talks about customizing the material to suit the exact needs of your enterprise, but it doesn’t give much advice on how to go about doing this. In this two-part Guideline our enterprise architecture expert Roger Evernden will provide you with some practical tips and advice for adopting and adapting TOGAF to meet your needs. 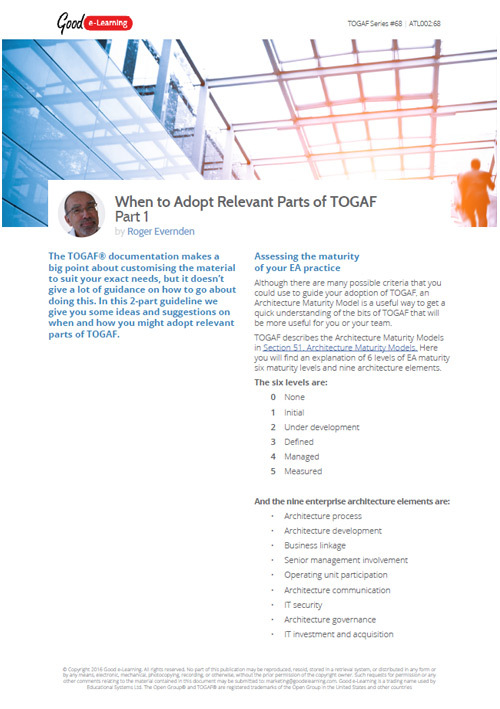 It starts by explaining how an architecture maturity model will help you decide what you need from TOGAF, and when you need it. It then goes on to provide some heuristics to help you think about how you should go about customizing TOGAF, and then gives some detailed suggestions on which bits of TOGAF to use and how to use them. Download this free TOGAF learning resource and you’ll also get instant access to our library of 490+ business & IT learning resources!